The National Catholic Youth Conference (NCYC) held on Nov. 16-18 in Indianapolis offered 20,000 youths from across the country a host of speakers to be inspired by, games to play, musical artists to hear, service projects to take part in and booths of exhibitors to visit. Among this broad array of opportunities, though, many youths made it a priority to experience God’s mercy in the sacrament of penance. 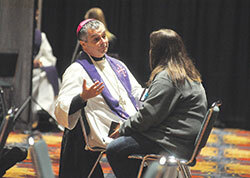 Youths filling Lucas Oil Stadium and the halls and conference rooms of the Indiana Convention Center could be seen wearing colorful stickers that read, “I’m forgiven,” which they received after leaving the large room in which dozens of priests and bishops heard confession for several hours during the conference. Fatima comes from a state where Catholics are a distinct minority, making up only about 3 percent of its population. She said coming to NCYC in Indianapolis two years ago was a starting point for embracing her faith through her own choice. 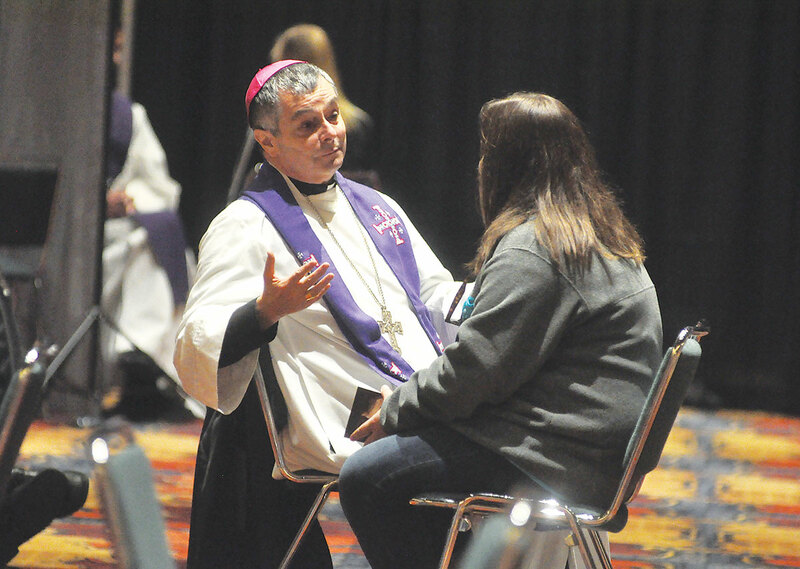 Cole Kreinbring experienced the sacrament of penance at NCYC for only the second time since he and his family were received into the full communion of the Church earlier this year in his hometown of Davenport, Iowa. “It was a big deal for me to kind of cleanse myself,” said Cole as he left the room where the sacrament of penance was celebrated. Coming to NCYC as a newcomer to the Church, Cole experienced the conference as a great boost to his faith. Coming out of the room a little later was Bishop Joseph G. Hanefeldt of Grand Island, Neb. He was attending NCYC for the first time, and was impressed by the number of youths who were attending and taking the opportunity to experience God’s mercy in the sacrament of penance. Karen Romero is a high school senior in Perry, Iowa, attending her first NCYC. She chose to go to confession in part to prepare herself for the closing Mass of the conference celebrated on Nov. 18 in Lucas Oil Stadium. “It’s really important for me to go in with a clean soul,” Karen said. “As teenagers, it’s so hard. We’re surrounded by sin. We love God and we show that love by having clean souls. Caelan Murphy from Ithaca, N.Y., was attending her first NCYC. She said celebrating the sacrament of penance would help her focus more on the good she was receiving at the conference. “It will definitely make it easier to remember the highlights of the trip and the things that really spoke to me, because I’m not worrying about all the other stuff that’s been weighing me down,” she said. “I can then go back and share that with everyone else in my parish and town.